For the record, I like to share my bike here in my blog. You might see my bike on my other social accounts but not yet here. I knew a folding bike is for me. When I saw it on Sumulong Highway, I know I can sit comfortably and I know I can ride it longer instead of other bikes. It's been a long time since I had a bike. We had one during our childhood days, BMX but we're big enough for the size of this bike. Buying a bike was included on my wishlist for 2015. I wait for few weeks searching for the better folding bike that fits my budget. 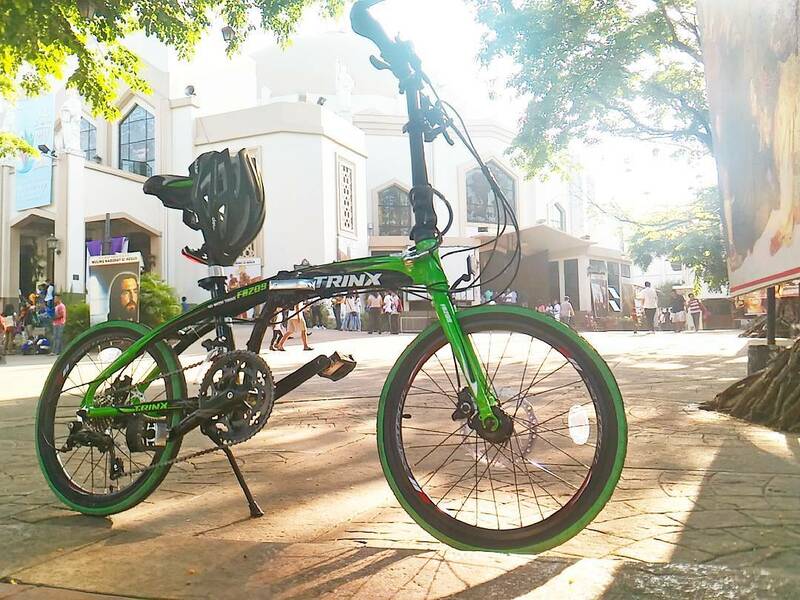 Finally, saw this Trinx FA209 folding bike that we know can survive Antipolo uphills. I'm not doing bike to work or uphill everyday, but I use it during weekends. Cycling is my exercise my body would love maybe aside from swimming, I just realized that while striving hard on an uphill but then feels great when I finished a little uphill without stopping. This is a good cardio exercise and fat burning as well. When I started cycling, I noticed how it made changes in my body and lifestyle. I realized that I do not wear a full makeup at all. Who needs one if you'll sweat after? But I still have my eyebrow gel and tint, I always have my sunblock with me. Hydrate! It's insane how I thirst for water after a ride than normal. Does riding dries out my throat? I felt sleepy after the ride. If I wake up around 6 to 7am which is my normal wake up, then had to bike, I felt like it was 3AM and need a long sleep. New hobby, new expense, but still happy with what I bought. Next items would probably be: upgrade for handlebar & front light. Haven't bought makeups lately because I'm saving for accessories and maybe upgrade parts. I think I had to check out my makeup drawers for new items to try on. I wish I could go to different places with beautiful scenery soon with my bike. Where will this year 2016 will take me? 2 comments on "My Folding Bike"
Just want to ask how much is your bike. Planning to get one also. Thanks!